Using emblems to show identity and belonging is certainly not a new concept. Emblems have been used for centuries among empires, societies, and communities of all kinds. There are many styles and complexities of emblem design, from heraldry to State seals to badges. Emblems and logos are not the same thing, but you can often find an emblem being used as a logo, especially in government and older non-profit organisations. The best emblems, in my opinion, are designed around a story, or points of significance, and have enough elements to be interesting (and slightly mysterious) but not overly busy. Fig 1: Various modern emblem designs. LTR: American Dentistry Association, State Seal of Kerala (India), and Toastmasters. The emblem I offer for consideration in this article is a small (but interesting) way to help show the familial relationship among Textpattern’s websites; not directly by what the emblem communicates, exactly, but by the mere fact all sites display it, which is the whole point of using one. The communication itself should be somewhat symbolic (slightly mysterious) rather than clearly spelled out, as the latter is what a website’s banner elements are for (logo, tagline, etc.). The ideal location for the emblem would be at bottom of a side-column, or in the footer (as TXP is currently using it). Walking through the process by which the emblem I worked on was conceived should help make clear the process I used, and the significance of each element incorporated. If you’re antsy, you can scroll near the end to see the finished design, but do come back and read the process. An emblem base is the foundation on which other design elements can be added. Geometrical shapes are a natural way of approaching this. In Figure 1, we can see a circle and triangle are prominent in the American Dentistry Association emblem, while for the Toastmasters emblem it’s principally a circle. The State Seal of Kerala isn’t as geometric, but it does express another frequently used technique in emblem design—symmetry—which is obvious in the other two emblems as well. A geometric shape should not be chosen randomly; it should have as much meaning as the other elements to be weaved into it. In this respect, I appreciate the Kerala Seal, because they could have just chosen a circle with no particular reason, and shoehorned all the meaningful things into it. I doubt that would have worked for them. In those cases where a geometrical shape is right, how do you know? I answered that by considering other aspects of the story first, and in this case I let a number lead the way. The number is also curious because it happens to be the version number of the much anticipated Textpattern 5, which will provide easier contributions to the core, easier theme creation abilities, improved extension development, and more—all of which relates with the kinds of content and resources the family of websites provide. Having the number 5, it’s no stretch to see that a pentagon (a five-sided polygon) is a good shape to try. We can think of each side and corner as representing one of the five websites in the Textpattern project. Other elements can now be added to the base shape. The key, as far as my aesthetic sensibilities are concerned, is to not cram in too much, or leave it too sparse. Ultimately, a story should be evident in the design—through text and symbolism—even if somewhat enigmatic. In fact, if the story is too obvious, there’s no mystique to the emblem, and depending on the objectives of the emblem, mystique can be a positive aspect of emblem design. Effective emblem design is often a balance of iconic symbols and text, not solely one or the other, so that’s how I tried to approach it too. Being better with text than graphics, I explored values of each website from the perspective of words first. I wanted meaningful words that captured the essence of each website’s core provisions and values. I played around with various value proposition models across the five sites (think word clouds with lines drawn between them). After a few pluses and minuses, the models spat out what seemed like a strong set of preliminary value words, as noted in Table 1. Table 1: Preliminary value words associated to each Textpattern website. † Words conveying how a given site (or the idea of it) may resonate with the community. But the value words still didn’t strike me as usable in an emblem. I wanted words that pierced to a deeper level; even better if they had some kind of harmony. The harmony among these words should be evident. Each word begins with the same strong-sounding letter, they’re relatively short (a benefit to design), and, perhaps most important, they’re desirable action words that may say what is true about the Textpattern experience. In fact, the Textpattern experience is the central message of my emblem’s story, and you might interprete it like this: The core and community come together to construct and create great web products that clarify message and meaning. There could be other stories to tell, and thus different central messages, but this one makes sense to me. After eight years of participation in this community, and most of them spent committed to community projects, I don’t think the message is off mark. Figure 3: A few chicken scratches with the emblem value words. At this point I started scribbling ideas on paper, ordering the words around the pentagon in different positions. I also oriented the words with the pentagon’s angles in a way that seemed best for reading them left to right. Words are unfulfilling in emblem design if left by themselves, so I tried to come up with five graphic symbols that would work nicely in the design too. I’m not particularly skilled with graphics applications, so I used icons that are readily available, and glyphs whenever possible. Yet I didn’t want my graphic skills to be a constraint on relevance; I still wanted the graphics representative of the values, even if the icons themselves were commonplace. And to be honest, glyphs are pretty hard to beat if you find the right ones. I thought about it in two ways: either match icons directly with a given value, or select icons that somewhat connected two values together. The latter notion seemed more interesting because of available space in the polygon and how value words would pair up (Table 2). Table 2: Icon significance in relation to flanking value words. † Could easily be hammer and chisel. Some elaboration on these icon choices might be in order. Heart: If you already use Textpattern CMS, the connection here is probably clear; people who use it, love it. Globe: A globe is an overused symbol on the internet, I know, but it’s overused because it just works in so many contexts, including this one. Textpattern is an international project. People from around the world actively engage in the community and create with the CMS. Interrobang: The interrobang (a great word) is a legitimate—if somewhat rogue—punctuation mark that’s meant to be used on exclamations phrased as enquiries, or maybe the other way around. Unfortunately, keyboards don’t cater to it, but you will sometimes see people combining a question mark and exclamation mark to mean the same thing (”? !” or “!?”). That’s probably quicker, but pulling one from glyph palette gives better results: unicode value U+203D. I used it as a bridge icon here because theme development in Textpattern is to date a scatter-shot affair (thus the question mark part), and the user documentation will eventually make that more clear for people (thus the exclamation mark). Hammer and wrench (or chisel): Tools icons, in general, are another kind that are pretty overused on the internet, but still hard to refute. I put one here because the homepage of the wiki also uses a tool icon for the extension documentation, and thus it’s a consistent bridge. This icon could also be modified to be a hammer and chisel, for better symbolic coherence with Textpattern’s logo mark. Lightning: Like hearts and hammers, the lightning bolt looks great in emblems and exists as a nice glyph. But it also makes a little sense here in terms of it’s power significance. People can do a lot with Textpattern CMS out of box, but with some extension, the CMS can accomplish some pretty powerful tasks. I also looked around a bit too see what could provide some inspiration. I wasn’t having much luck beyond the guns and skulls Google was throwing up. I put the effort aside for a day—nearly forgetting about it—and then suddenly started discovering things out of the blue. Figure 4: A pentagon used in some promotional design for a martial arts exposition. The first thing I came across, while perusing a Mixed Martial Arts stack at Delicious (on the Delicious home page at the time), was use of a pentagon in a curious design advertising a martial arts event (Figure 4). The design reflected similar ideas I had already considered with regard to positioning the graphic elements, so that was encouraging. Their idea isn’t what I would call a real emblem, however. For example, it lacked a typographic tribute, and there’s no identity whatsoever. Figure 5: A pentagon used in a Toastmasters 25-year reunion graphic for a regional chapter. Another pentagon design I found (still not an emblem as I think of them), did the inverse of the first; using words instead of icons, though, again, in a similar way to what I had been thinking about (Figure 5). One notable difference was how they oriented the words “succeed” and “believe”, which didn’t seem like the best way to me. Then I came upon a real prize. A twitter friend happened to retweet something from ADX Portland (@artdesignpdx), the avatar of which caught my eye. When I opened it full size, a fantastic emblem—a real emblem—was revealed (Figure 6). Figure 6: A fantastic emblem symbolising ADX Portland. The ADX Portland emblem had it all: shapes (circles), text, typography, identity, and all together told a story. Gorgeous! Perhaps one nitpick would be there’s not enough mystery in the design—it’s really clear and obvious—but considering they’re using it as their shop sign too, it makes sense. On top if it all, ADX Portland seems pretty cool; they’re a group of “thinkers and makers” building aesthetically constructive things for the community. Woodworking seems to be a big part of it, and I love how the edge of their emblem reflects the teeth of a circular saw blade. That is the kind of thing to capture with symbolism when telling stories in emblems. Everything in their design means something. Nothing is frivolous. Obviously the white on black of ADX Portland’s design had an impact on me, as well as the double borders on the base shape. One could easily create an inverse colour scheme (black on light) that could work on any light coloured background. For that matter, you could probably have fun putting some colour and background patterns in this design too. The identity clue I used in this case was “TXP”. One could argue that’s too representative of the magazine’s new brand, but maybe it’s really a true compromise between the magazine’s name and how the community has used the abbreviation to mean the CMS. 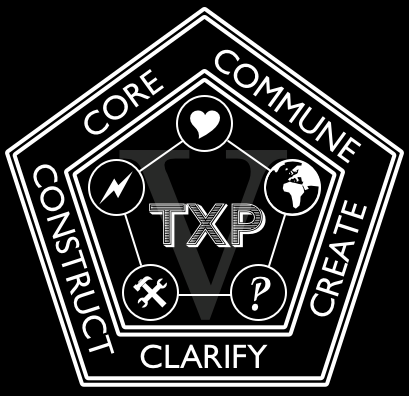 As I described in this Issue’s From the Editor, “TXP” really means the entire Textpattern project, as far as the magazine is concerned, and that’s what this emblem represents too. 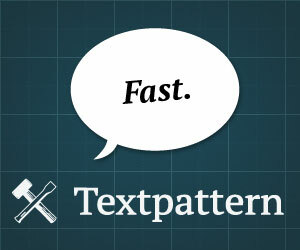 I tried using “Textpattern” but it took up too much space, in my opinion. Further, an abbreviation provides more mystique to the symbolism, and won’t compete with a given site’s own identity elements (logo, etc.). In other words, the emblem conveys what identity it belongs to, it doesn’t serve as site identity itself. What do we do with this thing? An emblem—mine, a variation of it, or something altogether different—is being proposed for adoption by Textpattern’s five websites. 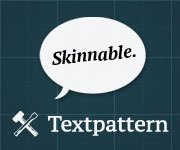 The emblem is meant to unite them as proud members of the official Textpattern clan. Sporting the emblem is a privilege only Textpattern sites enjoy; anywhere else would be considered infringement (and that will probably be put in writing somewhere). Each instance of the emblem’s use could feasibly link to the Textpattern About page (or a new location) where an explanation could be provided about the emblem’s relationship with the project’s five websites. Clever link exchanging, if you will. We’re using the emblem now in the footer of new TXP. If things go favourably, it will be implemented in the user docs and plugin directory too. We can only hope the other two sites follow suit. Nevertheless, you may consider the current emblem a placeholder design until something monumental comes along, if ever. We don’t think the emblem is horrible, but neither would we say there’s not room for making it better, and that’s where you might come in. If you creative types cared to try, and we know you’re out there, I could provide you with the emblem file to have a go at giving it some polish. I only ask that you make the request so we with TXP have an idea of who is serious about trying. Let yourselves be known in the comments and we’ll work it out from there. Preferably, someone would stick to the principles shared in the article and bringing the design all the way home to perfection. Any such contributions will be richly applauded in a future issue of TXP. The emblem should tell a story, similar to how I’ve tried to map one with my own. You should be able to explain how your design does tell Textpattern’s story, whatever the interpretation is. The emblem should incorporate both text and iconic elements, and everything should be relevant to the message; no frivolous elements for sake of design flourish. The story or central message should be slightly enigmatic, not directly expressed or dead obvious (remember, enigmatic is the one thing the ADX Portland emblem was not, as the identity was clearly written within it). No skulls, wings, knives, guns, ribbons, stickers, crosses…you get the idea. These five guides should help ensure we get closer to design options that are viable for use. This invitation closes at publication of TXP Issue 2 (sometime in May). If no designs are offered by that time, we’ll stick with the emblem we have. Let us know what you think in the article comments while they are open, as well in the TXP G+ page, which is open indefinitely. Maybe in the future it becomes a design for a limited edition tee-shirt too.